Amazon is hiking the cost of Prime membership in the US from $99 to $119. The company has already increased the cost for new members and it will begin charging the higher rate for renewals next month. We see this as a risk, and in this week’s note, we outline why. In the US, almost two-thirds of consumers have access to Prime. When we surveyed US consumers in January, some 43% of respondents said that they have a personal Prime membership and a further 21% said that they have access to Prime benefits through someone else in their household, indicating that a total of 64% of Americans have access to the program. The remaining 36% of those we surveyed said that did not have any access to Prime membership. That high overall access rate means that Amazon’s opportunity to grow Prime memberships is becoming more limited, which may be tempting Amazon to try to recoup some more of the costs associated with Prime through higher fees. The risk with the fee hike is that Amazon could be jeopardizing the rate at which it grows sales in newer categories. Time after time, Coresight Research consumer survey results have underlined that Prime membership correlates with a greater likelihood to shop on Amazon for categories that have not traditionally been core to the retailer’s offering, such as food, beauty and apparel. 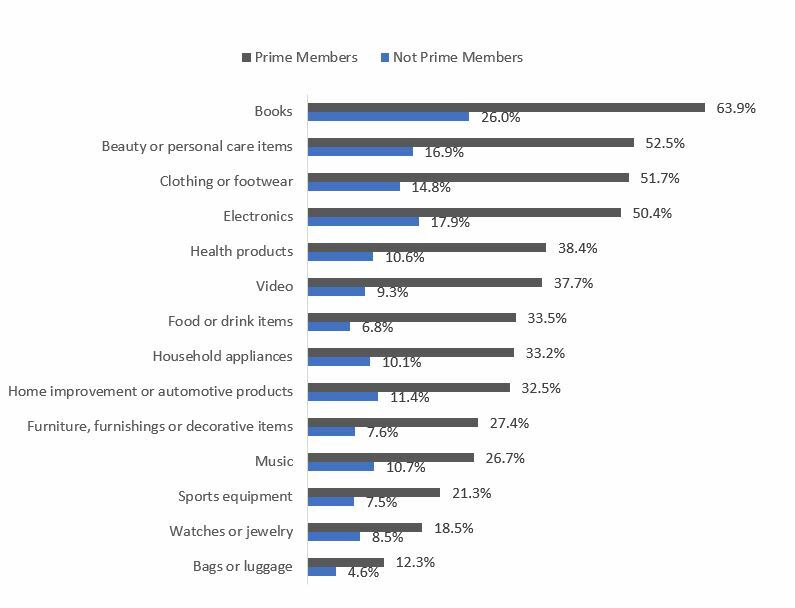 As we chart below, our January consumer survey found much higher penetration rates for these kinds of categories on Amazon among Prime than among those without Prime membership. 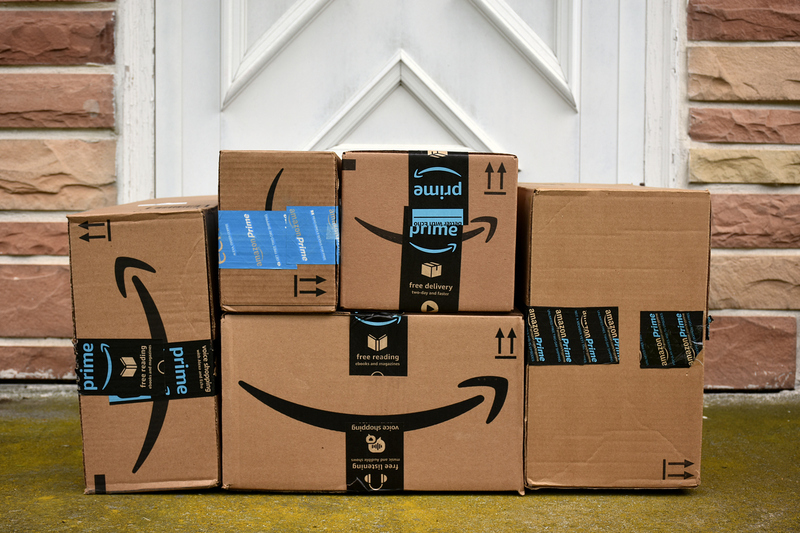 The obvious implication is that having a Prime membership encourages consumers to shop across categories on the site and to try it out for purchases of categories that they might not have associated with Amazon in the past. Amazon’s price hike therefore looks dicey, as any slowdown in new Prime memberships threatens to drag on the company’s growth in categories such as groceries and apparel—huge total markets that form the cornerstones of retailing. Base: 1,699 US Internet users ages 18+, including 726 with a personal Prime membership and 615 with no access to Prime membership, surveyed in January 2018. “Prime Members” have a personal Prime membership; “Not Prime Members” have no access to Prime benefits, including through a membership of someone else in their household. Which Competing Retailers Could Benefit Should Prime Members Cancel Their Subscriptions? We do not anticipate substantial numbers of Amazon customers will cancel their Prime memberships. But, if major numbers of consumers do start canceling their Prime memberships and shopping less frequently at Amazon as a result, Target, Costco, Nordstrom and Old Navy could be among those to gain shoppers. Our recent consumer surveys on the grocery and apparel markets found that Target and Costco shoppers had significantly higher Prime membership rates than average grocery or apparel shoppers did. And our apparel survey similarly found that Nordstrom and Old Navy shoppers had higher-than-average Prime membership rates. Potentially Sacrificing Retail Growth to Invest in Nonretail Benefits? Amazon’s Prime membership price hike comes at a time when the company is significantly investing in the video content that Prime members enjoy as part of their membership: Amazon is on course to spend around $5 billion on video content this year, up from $4.5 billion in 2017, according to JPMorgan, as cited on MediaPost and Business Insider. This compares with its 2017 revenue of $9.7 billion for its subscription services across Prime, audiobooks, e-books, digital video and digital music. So, Prime members will continue to get more (nonretail) benefits for their money as their membership brings them a Netflix-style offering. The question is whether Amazon risks softening the retail side of its business as it pumps around half of its subscription revenues into services such as video.